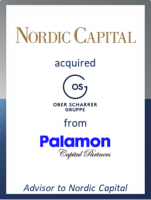 Nordic Capital Fund IX ("Nordic Capital") announced the signing of the acquisition of Ober Scharrer Group ("OSG"), a leading ophthalmology outpatient chain in Germany, from Palamon Capital Partners. GCA Altium acted as exclusive financial advisor to Nordic Capital. OSG is Germany’s largest provider for treatments for major causes of blindness and visual impairment as well as non-invasive treatments and diagnosis of eye disorders. Founded in 1982 and headquartered in Fürth, Germany, OSG offers a broad spectrum of specialized ophthalmic treatments and provides high quality medical care to both public and private patients. Key services are surgical treatments such as cataract operations and Intravitreal Operative Drug Application (IVOM) for degenerative eye disorders. The Group has 900 employees performing more than 85,000 treatments per year across its c. 80 clinics in Germany. As a leading healthcare investor with a 25-year track record of building high quality, sustainable healthcare businesses, Nordic Capital intends to support and further develop Ober Scharrer in line with its current strategy. The parties have agreed to not disclose the financial details. The transaction is subject to customary regulatory approvals.